New Listing2012-13 ITG History Gold Canada Wins 2002 Games Joe Sakic Avalanche /10 RARE! You are bidding on:(Quantity - 3) 2014-15 Leaf - ITG - Top Prospects "SILVER" Edition - "MITCHELL MARNER" - Rookie Cards - All 3 cards - Mint. All 3 cards - serial number ### / 500. You are bidding on:(Quantity - 3) 2014-15 Leaf - ITG - Top Prospects "BLUE" Edition - "NICK MERKLEY" - Rookie Cards - All 3 cards are graded - GMA 10 - Gem Mint. All 3 cards have the same serial number #14 / 25. 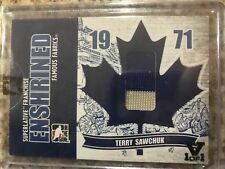 This is a listing for a ITG Superlative Vault (1 of 1) Terry Sawchuk Enshrined Jersey Card #E-25 (#d to 9). LEAF IS PROUD TO BRING TO THE HOBBY AN EXCITING ADDITION TO OUR INDUSTRY LEADING HOCKEY PRODUCT PORTFOLIO WITH 2017-18 LEAF HOCKEY! LOOK FOR AN EXCITING MIX OF NOSTALGIC DESIGNS AND NEW CONTENT! Such as Georges Vezina, Cyclone Taylor & Percy LeSueur. 2015-16 ITG USED JERSEY AUTOGRAPH GOLD #GUA-RB1 RAYMOND BOURQUE 08/10 !! 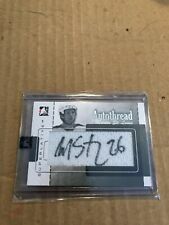 2006-07 ITG Ultimate Memorabilia Autograph Auto Maurice Richard 27/30 !! 2014-15 ITG HEROES AND PROSPECTS PROSPECT AUTOGRAPH #51 LOGAN BROWN 46/80 !! Doug Gilmour. This Is The Red Foil Vault Version. Francise Autograph Jersey Patch Number. Beautiful 2 Color Jersey Number Patch Card. This is a listing for a 2012-13 In The Game History Of Hockey Mario Lemieux 2004 World Cup Game-Used Team Canada Jersey (#d 04/10). 2000-01 BAP ULTIMATE MEMORABILIA GAME-USED STICK #GS-09 WAYNE GRETZKY 23/90 !! 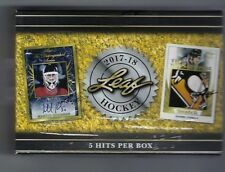 2017-18 ITG Superlative Blades Of Steel Alexander Ovechkin skate 9/9! !